The Samabe high tea by the beach is the most popular afternoon activity in Bali. 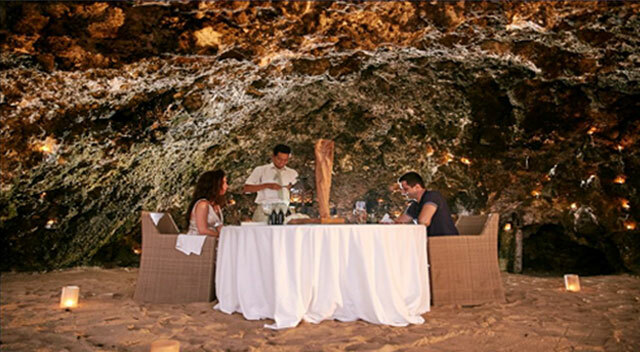 A memorable experience at the beach cave of Samabe Bali located in the Nusa Dua area. You will never forget your visit, as you walk down the stairs to the beach or use our unique Beach Shuttle. You will enjoy a sandwich selections of: smoked salmon & salsa verde, salted beef & pickles, cheese & chutney freshly baked scones served with Cornish clotted cream and strawberry jam, pastry of the day, chocolate brownie, selection of tea & coffees and a glass of Balinese Champagne. The high tea arrangement by the beach, non-motorized water sport, changing room, beach activities, use of beach towel, lounge chair or bean bag. High Tea in Beach Cave is served daily from 14.30 to 17.00 hours. No advance reservation needed, just come to the Front Office, fill in the registration form, make the respective payment and receive your ID. The hotel reserves the right to black out dates and limit the number of Guest each day. All guest using pool or beach and non-motorized water sport equipment do so at their own risk.